Pit bull Everley and her puppies at Pets Aloud Veterinary Hospital in New Jersey. OAKLAND, New Jersey (WABC) -- The Ramapo-Bergen Animal Refuge in Bergen County, New Jersey is asking for help after a young, sick abused pit bull mix delivered 8 puppies. Everley was recently rescued by a local shelter, emaciated and with a huge pregnant belly. Even more horrifying than her gaunt frame and belly was a wound on her that had been stapled shut by someone with a staple gun. When Everley arrived at the local shelter, staff worried that the birth was eminent, and Everley was in no shape to go through it alone. They reached out to local rescues and Ramapo-Bergen Animal Refuge stepped in. 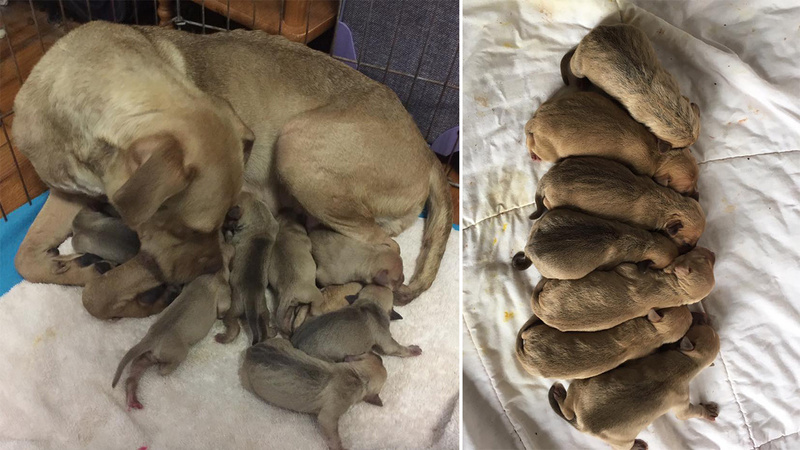 Before Everley could be moved, she gave birth to 8 beautiful babies. Rescue officials say Everley is an amazingly strong mother. Even with her own health failing, she still anxiously tried to care for the pups, but unfortunately, she is too undernourished that she cannot produce mike or nurse them. One has passed away. Everley and her puppies are currently at Pets Aloud Veterinary Hospital. Dr. DeMaria helped this family in desperate need without hesitation. They say Everley has finally began to eat and they are hopeful that she will be able to regain care of her puppies. The cost of care is very expensive, so Ramapo-Bergen Animal Refuge is reaching out to supporters and others to please make a donation to the Betty Lou Medical Fund. Ramapo Bergen Animal Refuge, Inc. is a non-profit, no-kill shelter serving all of Northern New Jersey.